The Chronicles of Fuji: Bam! Boom! Ka-Pow! The same rule applies for trading cards. 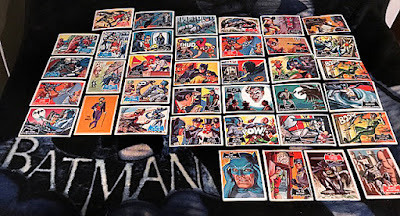 I have been wanting to add a few cards from the 1966 Topps Batman sets to my collection for years. However something always seems to get in the way of me making the purchase. Sometimes the price is too high. Other times... I simply get sidetracked and lose interest in them. Thankfully... the problem has been officially solved. 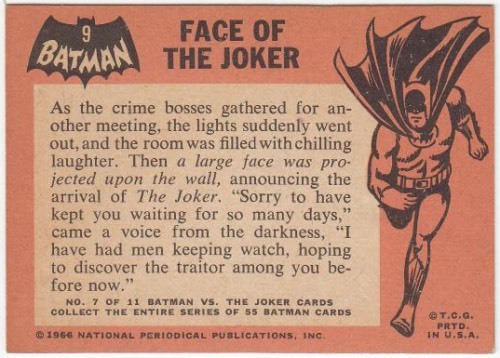 Back in May, Corky over at Pack War blogged about his Bat Signal card. You can check it out... here. His post motivated me to head over to COMC and track down three of the four cards I had been looking for. 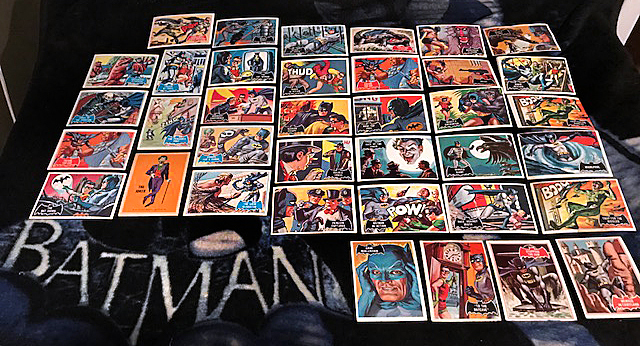 One of the vendors was running a sale and had a bunch of his 1966 Topps Batman cards for $1.35 each, which I felt was reasonably priced based on the condition of his cards. 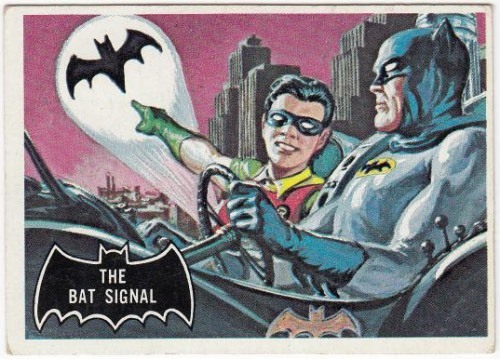 And finally... this is my favorite card out of all of the 1966 Topps Batman Black Bat series. 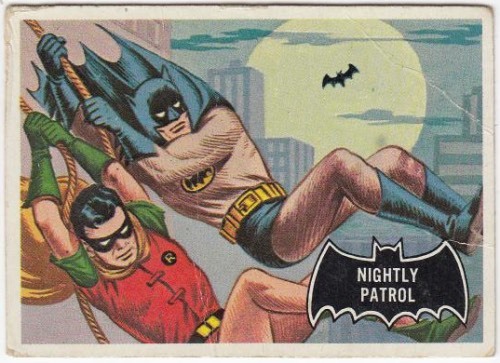 Seeing the Dynamic Duo swinging across the moonlit sky is simply put... a masterpiece. With those three cards out of the way... I'm just looking for card #1 from the Black Bat series. 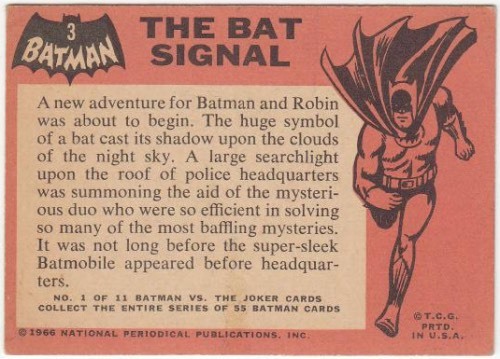 Being the first card in the set, it's going to have condition issues... plus it features a popular image of The Caped Crusader soaring down with his cape fully expanded like the Bat Signal. Update (12/4/17): I recently was contacted by a guy who has a bunch of these singles. He's looking to sell them. If you're interested, you can contact him at watphoto@gmail.com. You picked some great cards from a very cool checklist. shoeboxlegends - oh man... you're right. that card is awesome! 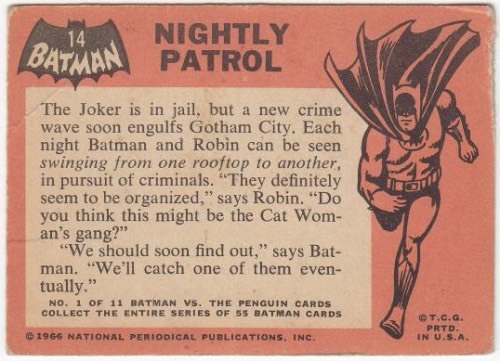 After I completed the "Batman vs. Joker" subset I put my search for Batman cards on hiatus... but I'm going to have to chase down the "Nightly Patrol" and "Striking Out The Cobra" cards! I have the reprint set,but your post makes me wanna track down the originals. 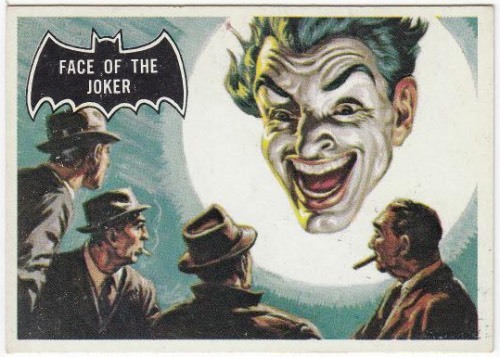 Cesar Romero never won an award for his portrayal of The Joker? I find that hard to believe. sport card collectors - thanks! snorting bull - he might have. but when it comes to the jokers i'm familiar with ledger and nicholson are the ones that come to mind. Sports Card Trifecta #23: Ken Griffey Jr.